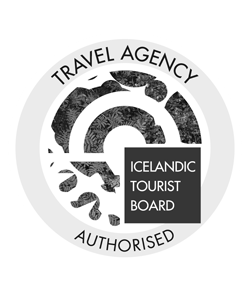 Iceland is home to 32 volcanic systems encompassing around 130 volcanic mountains, 18 of which have erupted since the settlement of Iceland in around 871 CE. Some volcanoes are considered to be extinct because they have not erupted for more than 10,000 years and are not expected to erupt again. A dormant volcano is often said to be one which has not erupted in the last 10,000 years but is expected to erupt again. It is important to remember that these categories and timescales are not universal. Some experts use a 4,500 year timescale for dormant volcanoes and a few do not distinguish between dormant and extinct volcanoes at all. Others utilize entirely different timescales. One fact is very certain: Iceland has many active, extinct and dormant volcanoes! Take a look at our volcano tours. Is Iceland a volcanic island? 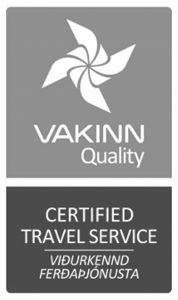 Are there any active volcanoes in Iceland? Why does Iceland have so many active volcanoes? What type of volcano is found in Iceland? What about eruptions in Iceland? Yes, Iceland is most certainly a volcanic island! The island ‘raised its head’ above the Atlantic ocean around 18 million years ago, when it was formed by extensive volcanic eruptions. Around half of the land mass consists of volcanic desert areas which were formed more recently. One-third of the basaltic lavas erupted in recorded history spewed out of Icelandic volcanoes. There are many active volcanoes in Iceland. At the time of writing, there are no erupting volcanoes but in a land as volcanically active as Iceland this could change very fast! There were 39 eruptions in the twentieth century alone. There are a couple of reasons why Iceland has so many active volcanoes. The rift between the divergent Eurasian and North American plates runs right through Iceland from the south west at Reykjanes to the north east where it is known as Kolbeinsey Ridge. This ridge runs along the floor of the Atlantic ocean as part of the longest mountain range in the world. It stretches from the Mid-Arctic Ridge to the north east of Greenland all the way to the Bouvet Triple Junction in the South Atlantic. There are four main zones which are relevant to Iceland: the Western Rift Zone, the Eastern Rift Zone, the Northern Rift Zone, and the Tjörnes Fracture Zone. Particularly within the area between Hekla, Katla and Vatnajökull, the manner of rifting ensures that the earth is easily torn open, making way for very large eruptions. The other reason why Iceland has so many active volcanoes is that it is a volcanic hotspot. Geologists do not always agree as to why this is so because more than one theory is plausible. Some experts say there is a mantle plume underlying the center of Iceland. This plume, or very forceful upwelling of super-hot magma, is presumed to originate at the core-mantle boundary. This is the earth´s only major thermal boundary, which sits at a depth of around 2880 kilometers. A super-plume is a conduit for an abnormally hot stream of molten rock, which rises from this thermal interface. This super-heated jet is generated and empowered by the cooling processes and heat exchanges which take place when very hot material from the earth´s core meets the cooler rock at the mantle. The tremendous heat and energy which is released is compelled to flow upwards! Mantle plumes often exist in places where there are no tectonic plate boundaries, although in Iceland, there are, of course, also major tectonic plate boundaries. Experts who posit the view that a mantle plume is the cause of Iceland´s hot-spot naturally accept that tectonic plate boundaries also contribute greatly to Icelandic volcanism. The greater igneous crustal thicknesses found along the Ægir and Kolbeinsey Ridges have been cited as evidence of interaction between a mantle plume and the Mid-Atlantic Ridge. The other theory postulates specific patterns of tectonic plate movement in certain areas as the sole cause of the volcanic hot-spot. The manner of movement of the Eurasian plate between Grímsvötn volcano and Surtsey, in combination with the movement pattern of the North American plate between the Grímsvötn volcano and the Snæfellsnes volcanic belt, is the culprit! The most common volcanoes in Iceland are composite or stratovolcanoes which stretch out in a line, often across large areas. Shield volcanoes, which are shaped like a warrior´s shield set down on the ground, are also common. 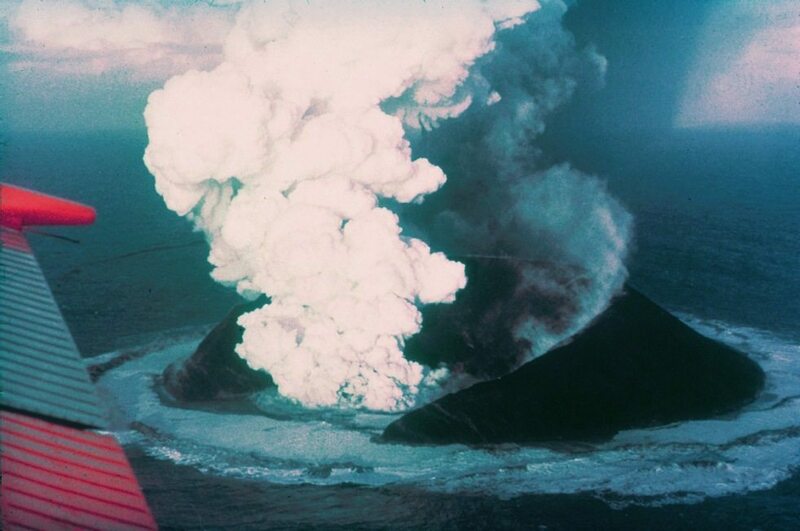 The Surtsey eruption in 1963 is a good example of a shield volcano. There are caldera eruptions such as Askja and table-mountains, for example, Herðubreið, the national mountain of Iceland, known as the Queen of Mountains! The glorious Hekla is a stratovolcano. There have been many fissure eruptions, the best known is the eruption of Eldgjá, a fissure of Katla which produced the largest volume single eruption lava flow in the world. Bárðarbungu is a central volcano with a massive caldera which is 10 kilometers across, however, its structure blends together various volcanic features including shield, strato, tuya formations, radial volcanic fissures and volcanic ridges. The 2014/2015 eruption, which gave birth to the Holuhraun lava field, was actually a fissure eruption between Bárðarbungu and Askja. There have been many volcanic eruptions both before and after the time when Iceland was settled. Many of Iceland´s active volcanoes are situated beneath glaciers. These eruptions are called subglacial eruptions, which often create massive and very destructive glacial floods, known as jökulhlaups. The interaction between boiling magma and glacial ice can cause a jökulhlaup, whether or not the red-hot lava has broken through the surface of the ice. During a subglacial eruption, cauldrons (depressions caused by melting) can appear in the surface of the ice covering a caldera – this happened with Bárðarbungu in 2014. Sometimes the resulting meltwater will drain beneath a glacier, swelling local rivers but not creating a real jökulhlaup. Often, though, meltwater will be retained beneath the surface of a glacier for a while before part of the structure gives way, causing a jökulhlaup. This happened with the 1996 Gjálp eruption, when meltwater drained into a subglacial lake for five weeks before this ruptured, releasing the largest jökulhlaup in living memory. It is not easy to convey the magnitude of a jökulhlaup because it is quite unlike any other kind of flood. Tourists sometimes say they would like to witness this phenomenon but the reality is no one is safe if they are anywhere nearby. If Katla under Mýrdalsjökull glacier were to erupt a huge area along the south coast of Iceland would need to be evacuated. The small town of Vík is more than 25 kilometers from Katla, nevertheless, in the event of a plausibly sized jökulhlaup, only the church on the hill would be left above water. Huge canyons have been created by jökulhlaups, with great volumes of rock being torn asunder. 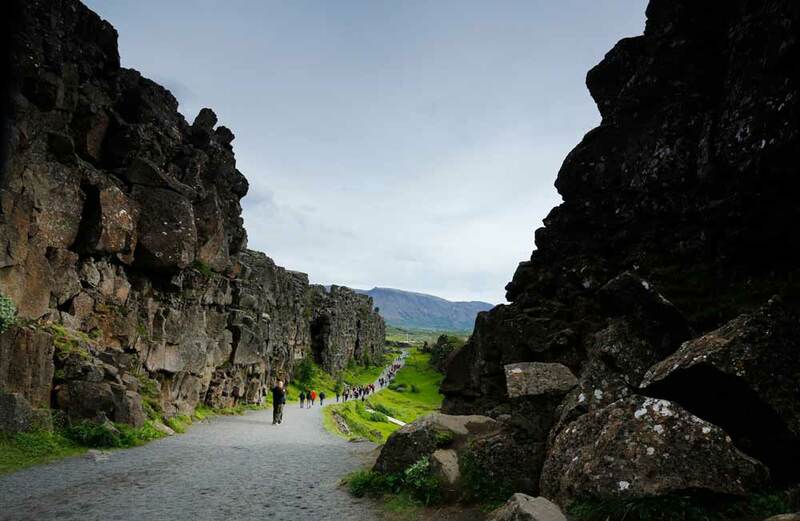 Majestic Ásbyrgi, a magnificent horseshoe-shaped canyon with walls over 100 meters high, was created by monumental glacial flooding from North Vatnajökull. Here a vast volume of meltwater had been held back by an ice dam before this broke away, carrying everything with it and gathering rocky boulders larger than apartment blocks as it continued its cataclysmic journey. Those people who settled Iceland lived out their lives up close and personal with the volcanoes in their new homeland. Not surprisingly, they sought ways to understand and explain the ways of these mysterious and capricious fire giants. Some charming and fascinating legends developed as the people made sense of their surroundings. These legends also give a great insight into the understanding of the cosmos which those who migrated to Iceland brought with them. Nearly all of the people who migrated to Iceland were Pagans who worshiped the Norse Gods. Christianity came to the land comparatively late in 999 or 1000 CE. The conversion of the Icelandic people from worshipers of the Norse Gods to worshipers of Christ was uniquely peaceful. Upon the proclamation of the Law Speaker and Höfðingi Goði (Chief Goði), Þorgeir Ljósbetningagoði Þorkelsson, Christianity became the official religion of Iceland. The Christian Norwegian King, Olaf Tryggvason, and his men had placed great pressure upon the Icelandic people to convert, and increasing numbers had done so, creating a chasm in Icelandic society. Things had threatened to descend into a bloody civil war. Many man on both sides of the dispute had arrived at the Alþing, the annual meeting of the Icelandic Parliament, armed for battle. In search of a peaceful solution, Þorgeir had retreated to meditate beneath his fur cloak. For the people of those times this was a sacred act, imbued with great significance, perhaps the equivalent of a great leader and shaman seeking otherworldly wisdom on behalf of his people. Emerging from his cloak he made his way to the Lögberg (Law Rock), where he addressed the expectant crowd in a most conciliatory and surprising way. To cut a long story short, the official religion of Iceland would henceforth be Christianity but Paganism could still be practiced in private. The Pagan Goðir, who had been the important political and religious leaders, simply converted to Christianity. Many were immediately baptised in Þingvatn, the lake very close to the Alþing at Þingvellir. In old Iceland a chief was both a political and a spiritual leader, chiefdom could only be held by those who followed the official religion of Iceland. People publicly worshipped Jesus Christ and extolled the ways of Christianity, but how quickly did their view of the world really change? Their beliefs had been inseparable from their understanding of earth, sky, bird, fish and the powers which fashioned the whole cosmos. This is what had helped them to live in greater harmony with life and to survive hardships. Some sayings, sagas and legends can offer us a window through which we can, many centuries later, peep into their world. This is the only volcano in the world where you can to take an elevator down into the heart of a magma chamber! This is only possible in Iceland. The Þríhnúkagígur volcano last erupted around four thousand years ago. The magma chamber has become sealed, the sizzling hot magma which once filled the chamber has long since drained away, so this volcano is well and truly dormant. Volcanologist, Haraldur Sigurðsson, said it was just like someone pulled out a giant plug and let all the magma out. So the magma became a solid part of the walls of the chamber or made its way back into the depths of the earth. The Þríhnúkagígur volcano is about 25 minutes drive from Reykjavik not far from Hafnarfjörður in Bláfjöll National Park. 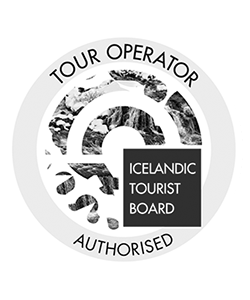 From the Blue Mountain (Bláfjöll) meeting point there is then a 2 km hike across the lava field to the entrance. Þríhnúkagígur means three peaks crater, which is wonderfully descriptive, the peaks of the three craters stand silhouetted dramatically against the sky-line in Bláfjöll National Park, a nature reserve. Cave explorer, Árni B Stefánsson, considered to be Iceland´s foremost cave expert, discovered the crater in 1974. It was a very long battle to get permission for the facilities which opening to the public would require. Tours into the magma chamber have been permitted since 2012, with extremely strict environmental protection guidelines being followed. From May to September the tour is operated, the rest of the year all traces of the visitor facilities, including the comfortable reception and refreshment hut must be erased from the landscape. The kind of open elevator used for cleaning and maintenance work on skyscrapers is used to take six or seven people at a time down through the neck of the vault into the chamber. Safely harnessed and with hardhats and miner’s lamps, they descend slowly on a six-minute journey, giving them the best opportunity to appreciate this amazing natural wonder. The funnel-shaped magma chamber is huge, covering an area the size of three basketball courts. Reykjavík´s famous Hallgrímskirkja church or the Statue of Liberty could stand within it. The total depth is 213 m (700 ft), and visitors are startled by the extraordinary colors within the chamber. As well as providing the setting of the totally unique tour, Inside the Volcano, taking visitors down into the Thrihnukagigur magma chamber, a couple of well-known musicians have recorded albums or performed concerts at this surreal and atmospheric venue. The Icelandic band, Kaleo, recorded Way Down We Go within the magma chamber, no doubt encountering some one-of-a-kind acoustics! When Chino Moreno, singer and guitar player of the rock band, Deftones performed a concert in Hríhnúkagígur as part of the 2016 Secret Solstice Festival footage was broadcast by the BBC, placing Þríhnúkagígur very firmly on the world stage. An increase in the magnitude and number of earthquakes will precede and accompany a volcanic eruption. “The trolls are making love“ is an old Icelandic saying which would be used when earthquakes were felt. Trolls were mountain beings. Volcanoes it was often said that men of prayer could command the elements, halting the flow of lava or turning the wind to save farms and communities. Fire Mass (Eldmessa) on 20 July 1783 with lava from the Laki eruption advancing ever closer to his church at Kirjubæjarklaustur, Reverend Jón Steingrímsson, conducted his famous Fire Mass. The relentless lava flow which had threatened to engulf the town halted during the service. For ever after he was known as The Pastor of Fire. Hekla the name is said to originate from “crochet”, a sleeveless garment which it is thought bore some resemblance to the shape of Mount Hekla and the clouds which often appear around it. Interestingly, in Icelandic “to crochet” is “að hekla”, so it would appear there is a relationship here which is reflected in the language. In the middle ages, many people said that Hekla was formerly the hell which God had encountered here on earth. It was a cleansing place where the souls of offenders, the faithless and those who had drowned or died in a vicious way went, carrying their devils and demons on their backs. From all directions ,the haunting cries of these hungry and desolate souls could be heard as they cried out in anguish. It is said that the devil roamed the ice with these souls in between, roasting them in the fire so they would not feel the deadly heat. Witches who held their meetings on Hekla said they saw groups of evil fools nestling in the flaming crater. It is said that coal-black ravens with iron beaks were seen flying around Hekla´s fires of hell. The witches were certain the devil flew within iron-nosed ravens such as these. There is still a legend that witches gather on Hekla for Easter. Hekla “The Gateway to Hell”. In the Middle Ages, Europeans often referred to Hekla in this way, such was their fear of the devastation an eruption of this volcano would deliver. In the 16th century, Caspar Peucer, a German scholar, wrote that the gates of hell could be found in “the bottomless abyss of Hekla Fell”. Katla has the name of a well-known witch and sorceress who was housekeeper to the Abbot of Þykkvabæjarklaustur. She was a large and bad tempered woman who possessed a pair of magic breeches. When she wore them she could run faster than the wind and never grow tired. Many were afraid of Katla and kept away from her. Barði was the Abbot´s shepherd, in the eyes of Katla he could do nothing right, and he often incurred her wrath. One day when Barði could not locate the sheep Katla had ordered him to fetch, he became desperate and put on her magic breeches. Wearing those he could outrun the wind and very soon he had brought home all of the sheep. When she returned Katla knew he had borrowed her breeches, her fury knew no bounds and she drowned him in a vat of whey, allowing his body to sink to the very bottom. She built an illusion, every time she went near the barrel of whey people could hear her mutter “soon Barði will appear”, of course, she knew he could not. When she realised her secret was about to be revealed she put on her breeches and raced up to Mýrdalsjökull where she hurled herself into a canyon, and since that time this has been called Katla´s canyon. A huge and terrible glacial flood was unleashed soon after, the whole of the south coast area was flooded. Thus, the huge and terrifyingly active volcano beneath Mýrdalsjökull is called Katla, and people talk about the nasty work of Katla, the evil witch. Snæfellsjökull and Jules Verne´s novel, Journey to the center of the earth. The entrance to the center of the earth is in the heart of the Snæfell stratovolcano sitting under Snæfellsjökull glacier. Bárðarbunga eruption in 870. Some scholars say this huge eruption around the time when Iceland was settled influenced some of the descriptive imagery which appears in Völuspá, the first and best-known poem within the Poetic Edda. This poem tells the Nordic story of world creation and also of Ragnarök, the great battle between the Nordic God´s bringing the world to an end. The scenes of destruction in Ragnarök include the world being submerged in water, terrible and great changes in weather, the sun turning black and the whole earth burning. 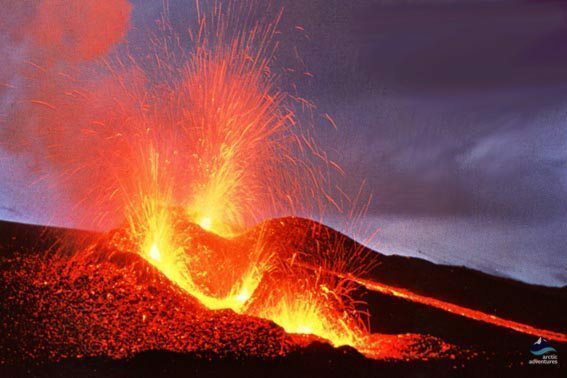 The powerful 870 eruption (VEI4) of the fire giant, Bárðarbungu, brought a catastrophic glacial flood, earthquakes, loud explosions and sizzling red hot lava together with ash which darkened the atmosphere and caused climate change. Of course, the story told in Völuspá is for many a serious matter which has its origin long before 870. It would not be surprising, though, if the author had been inspired by tales of this eruption when writing about the end of the world. Such stories were sure to be held within the oral tradition for many generations. Völuspá is available in English, and the English title is The Prophecy. A seer or prophetess foretells the destiny of the Gods and the Earth to the Norse God Oðinn. She begins with her story back in the origin of time, when she tells of the giants who reared her, and finishes at Ragnarök. Frequently she pauses to ask Oðinn “would you like to know more?”. Always she is bade to continue, and so she does all the way to Ragnarök. This very beautiful poem has been the subject of much discussion and conferences based on aspects of it have taken place. Fimmvörðuháls is the eruption in 2010 which preceded Eyjafjalljökull by a few days, this was not a subglacial eruption. A fissure, 0.5 kilometers long, opened at the northern end of the Fimmvörðuháls pass by the hiking trail between Þórsmörk and Skógar. Two new craters were formed, which have been named Móði and Magni after the sons of Þór, the Norse Thunder God. 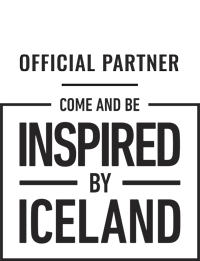 The new lava field is called Goðahraun. Eyjafjallajökull is the stratovolcano whose name twisted the tongues of news readers when super-fine ash from the 2010 eruption curtailed international flights. At the end of February, unusual seismic activity and rapid expansion of the earth´s crust heralded a warning that the magma chamber was filling rapidly. 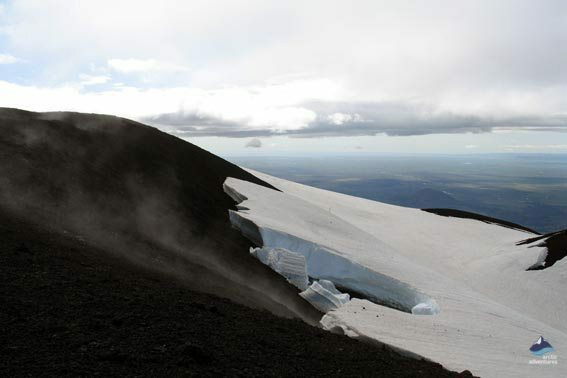 On 14 April 2010, an eruption commenced from the crater beneath the icecap, the resulting jökulhlaup swelled local rivers and 800 people were evacuated. Electrical storms produced some spectacular lightning shows. These were accompanied by loud explosions when meltwater entered the volcanic vent. The ice and chilled water caused the lava to fragment into extremely fine particles of silica which are particularly hazardous to aircraft. This super-fine ash was propelled unusually high into the upper atmosphere. The wind then transported it into the busiest air traffic zone in the world. 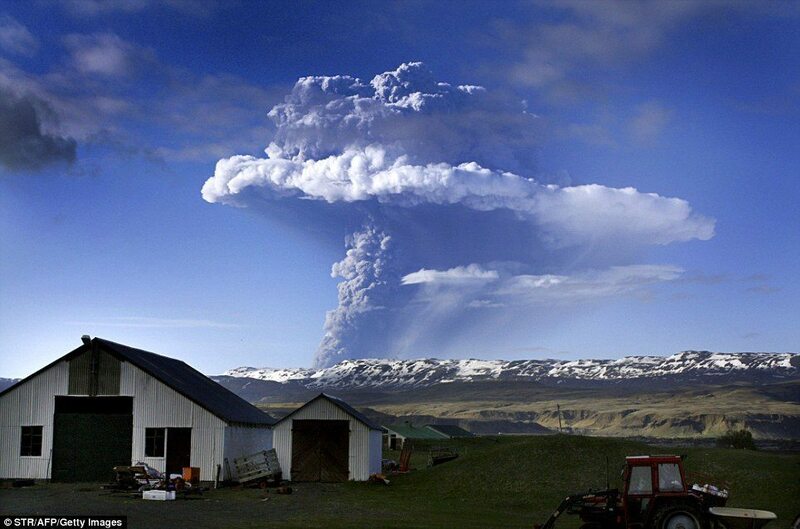 Eyjafjallajökull also erupted in 1612 and between 1821 and 1823 a series of eruptions occurred. There were medium-sized jökulhlaups and the ash contained an unusually high volume of fluorine, which above a certain dose is toxic to humans and livestock. Snæfellsjökull has erupted on three occasions in modern times, around 9000 years ago, 4000 years ago and most recently about 1750 to 1800 years ago. Eldfell on Heimaey/Vestmannaeyja began to erupt on 23 January 1973 in the middle of the night, awakening the shocked Heimaey residents. Not too much was known about this volcanic system at that time. It is now known that there has been considerable volcanic activity beneath the ocean off Vestmannaeyja (the Westman Islands) over the last few thousand years. On the night in question, Eldfell, a new volcanic cone, was formed. There was great concern that the lava flow would impede access to the harbor, which was vital to this fishing community. The resourceful local people pumped seawater onto the lava which diverted the flow, saving the harbor and averting economic disaster. There was extensive ash fall and the residents were evacuated for a time. Surtsey is the name given to the Island which was created by another volcanic eruption within the Vestmannaeyja (the Westman Islands) archipelago. This volcanic eruption began 130 m below sea level before it broke the surface on 14th November 1963, continuing until 5th June 1967. The island has a surface area of 1.3 km2 and is 155 m at its highest point. The development of life forms on the island is being studied by botanists. Undersea vents which produced Surtsey are part of the Vestmannaeyja submarine volcanic system. This system has also produced other tiny islands, for example, Jólnir. Bárðarbungu is a subglacial stratovolcano and the second highest mountain in Iceland situated under the north western part of Vatnajökull. People knew this vast ice-filled crater with its destructive fire-power was up there lurking ominously under the ice. However, the extreme remoteness of the location meant that until recent times less was known about this volcano than many others. The ice-filled caldera covers about 80 km2, 10 km in diameter and 700 m deep. The Bárðarbungu volcanic system is rather complex, and research has revealed many layers of tephra which originated from other volcanoes have erupted via this volcano. The 1996 Gjálp eruption revealed that interactions can take place between the Bárðarbungu and Grímsvötn systems. The nearby Hamarinn volcano (Loki-Fögrufjöll), like some other volcanoes, does not have its own caldera, rather it is independent of Bárðarbungu but is connected to its fissure system. This huge and complex system reaches south-west into the Highlands between Vatnajökull and Mýrdalsjökull and stretches north east to Dyngjufjöllur. The largest single eruption lava flow in modern times stemmed from Bárðarbungu around 8500 years ago. This covered an area of approximately 950 km2, as it flowed south-west from the Highlands to the ocean between the Ölfusár and Þjórsár rivers, radically altering this part of the coastline. The volume of lava was greater than that from the Skaftáreldum and Eldgjá eruptions combined. Quite a few large eruptions occurred south west of Bárðarbungu before human settlement. 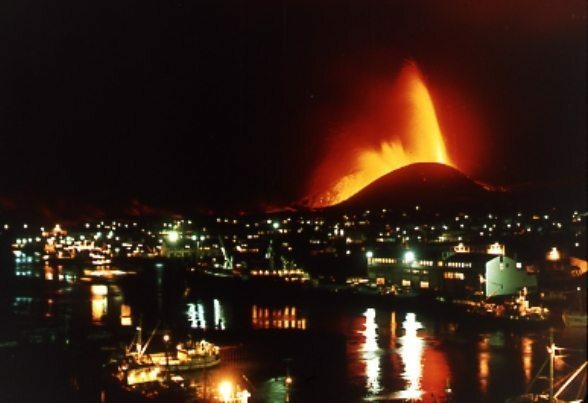 In 870 CE, when the first settlers began to arrive, the Vatnaöldur eruption took place. 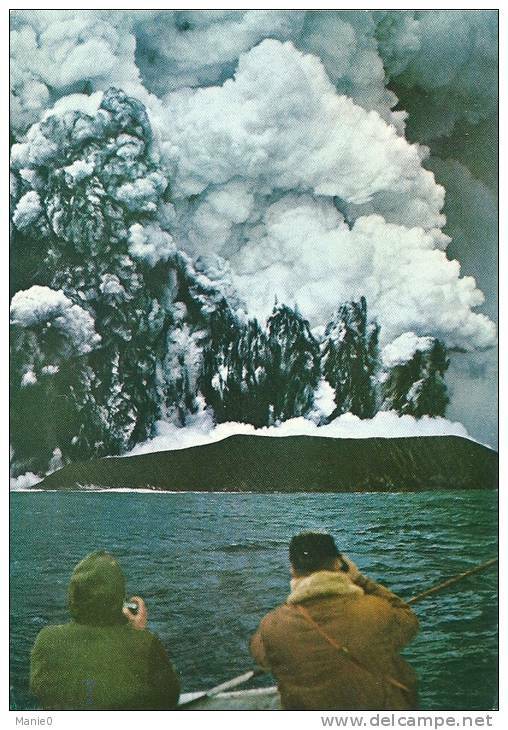 Later there were some eruptions north east of the glacier in an area known as Dyngjuháls. In the 13th century, quite a large volume (around 180 km3) of lava flowed at Frambruni. Around 1480, Veiðivötn, the most powerful Icelandic eruption in historic times occurred, and this is the only confirmed VEI6 volcanic event in Iceland. In 1797, there was a small lava flow in the now very well-known area of Holuhraun, site of the much larger 2014/15 eruption. Between 1701 and 1740, and also around 1780, quite a number of eruptions took place under the glacier from Bárðarbungu´s caldera itself or north east of it. There is evidence of fairly large jökulhlaups in Jökulsá á Fjöllum (river) in 1717, 1726 and 1729. 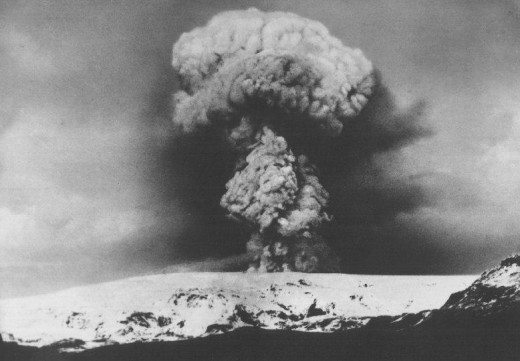 In 1910, there was an eruption from the Bárðubungu system, probably from Grímsvötn. In August 2014, Bárðubungu came alive with a huge swarm of earthquakes over a 48 hour period, some with a magnitude as large as 4.5. An eruption was reported to have begun under the glacier on 24th August, which did not break through the ice. This report was later retracted and then confirmed when ice melt patterns indicated an eruption had started then ceased. Beyond the glacier between Bárðarbungu and Askja, a new fissure eruption opened in the early hours of 29th August, followed by a second fissure eruption around 4:00 am on 31th August towards Dyngjuháls at Holuhraun. The eruption officially ceased on 28th February 2015. Increased earthquake activity around Askja was concurrent with the eruption, indicating an interaction between these systems. The scientists intend to conduct further research into this aspect. The 1996 Gjálp eruption indicated a possible interaction with the Grímsvötn system. Grímsvötn is a basaltic central volcano situated in the Highlands of South East Iceland under Vatnajökull glacier which has erupted more frequently than any other Icelandic volcano. Most eruptions are subglacial. The system stretches more than 100 km from the south west to the north east and is more than 20 km wide, making it the longest volcano in Iceland. Before modern scientific monitoring, due to its remoteness, people knew very little about this volcano. The caldera is 650 m deep and the lake in the middle is considered to be one of the most peculiar geological formations in the world. Every few years the ice-shell fractures unleashing a great flood known as a Skeiðarárhlaup, when the surface of the lake will drop by 100 m, causing a sudden pressure drop which causes increased earthquakes. Sometimes this will happen a few weeks after an eruption has ended, when the caldera´s meltwater holding capacity is finally overwhelmed. In 1996. quite a large section of Highway 1 (the ring road) across Skeiðará Sandur was washed away. Although the eruption had stopped, the geologists knew a large flood was imminent and closed the road. At least nine eruptions occurred in the 20th century, although there were none between 1938 and 1983. There were eruptions in 1996, 1998, 2004 and 2011. This last eruption was much larger than had been predicted. Katla is one of the largest and most active of Icelandic volcanoes. This volcano has a huge 100 km2 caldera shrouded beneath the ice of Mýrdalsjökull glacier, which is up to 700 meters thick. Estimates of Katla‘s flood discharge capacity during the 1755 eruption are between 200,000 and 400,000 m3/s, this is greater than the combined average flows of the Amazon, Mississippi, Nile and Yangtze rivers. Between the end of the 9th century and 2017 there have been more than twenty confirmed eruptions. The last major eruption was in 1918. So far the interval between eruptions has been between 13 and 99 years, so an eruption is overdue! It is likely there were very minor subglacial eruptions which did not break through the ice cap in 1955, 1999 and quite possibly in 2011. Tephra carbon dated to around 10,600 years ago has been found in Norway, Denmark and Scotland. This is thought to have originated from a huge eruption of Katla, which, it is estimated, produced 6 to 7 km3 of volcanic material. To give a sense of perspective the 1918 eruption only ejected around 0.7 km3. Gyroscopy studies indicate Katla had a small eruption between 894 and 898, not long after the settlement of Iceland. This was followed by a medium sized eruption in 920. The 934 Eldgjá (Fire Canyon) eruption stemmed from Katla´s volcanic system, pouring out an astonishing 18 km3 of magma, the largest basalt flood in historic times. This was a VEI5 or possibly even a VEI6 eruption. A more peaceful time followed with small eruptions in 1100, 1179, with the resulting Jökulhlaup destroying some farms around Höfðabrekka í Mýrdal, and another small eruption in 1245. 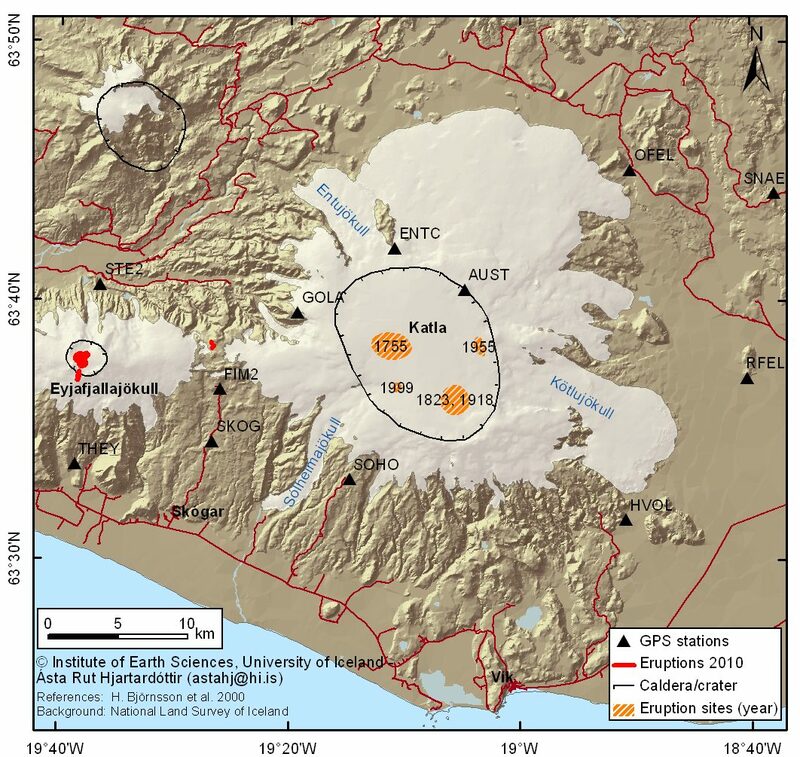 Katla´s 1262 eruption was the largest for about 330 years. Its size was comparable to the 1918 eruption. It is said ash obscured the sun and volcanic material lay upon the ground about 10 cm deep as far as 30 km away from the eruption. In 1357, after a rest of 95 years, a medium-sized eruption occurred covering large areas in Mýrdal with volcanic debris. In 1416, there was a fairly large eruption which it is said melted a valley through the glacier – the associated jökulhlaup is known as Hofðahlaup. This flood is likely to have reached all the way to Mount Hjörleifshöfða. According to The Book of Settlement (Landnámabók), an Icelandic Saga, Hjöreifr Hroðmarsson, a brother-in-law of the first Icelandic settler, is buried on the mountaintop here. There is some evidence that some very small eruptions took place between 1440 and the end of the 15th century. In 1500, a large eruption flowed in a westerly direction onto Reykjanes peninsula, covering the area with tuff (consolidated volcanic ash, a soft rock). It is likely a jökulhlaup also ensued. In 1580, Katla erupted again. Although this eruption was rather small, sources say it could be heard many kilometers away in Hafnafjörður. In 1612, another very small eruption took place. On the morning of 2nd September 1625, a powerful eruption began which persisted for 12 days. A total of 18 farms in Skaftártungu were destroyed and the resulting jökulhlaup caused great damage in the district of Þykkvabær. A huge volume of lava was ejected during the first night and the following day. The ominous trembling and explosions from the glacier could be heard like never before! 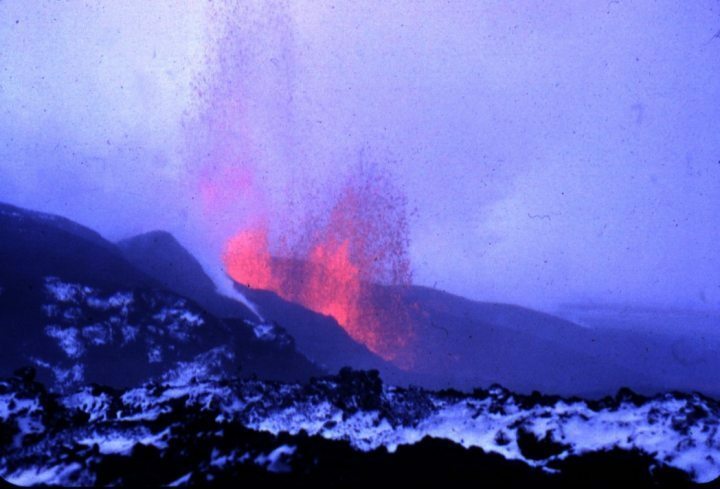 A detailed account of this eruption written by Þorsteinn Magnússon, the County Sheriff at Þykkvabær, has been preserved. In 1660, a medium-sized eruption over a two month period caused considerable damage to various structures and destroyed the church at Höfðabrekku. On 11th May 1721, another fairly large eruption took place. Throughout the morning the hard shuddering of earthquakes had sounded throughout the neighborhood, heralding the commencement of the eruption at noon. A vast jökulhlaup flooded all of Mýrdalssandur on its way to the ocean, causing the sea level to rise all the way to Grindavík, changing ocean currents and damaging ships. The coastline was changed forever. In Hvalfjörður, people had to switch on lights to eat lunch, so great was the ashfall which obscured the sun. Five days later, the all-day murkiness enveloped the people of Eyjafjörður, a couple of hundred kilometers away. The eruption was most active during its first week but it did not cease before autumn came. In 1755, the largest eruption for 800 years from Katla´s Eldgjá began after powerful earthquakes trembled beneath the glacier. The eruption mainly flowed to the east causing great damage to Álftaveri, Skaftártungl and beyond. The jökulhlaup was large but smaller than the one in 1721. Two people were killed by lightning strikes in the electrical storm which followed the eruption. On 26th June 1823, there was a rather small eruption. The resulting jökulhlaups were more significant than the eruption itself, causing damage in Áfltaveri. 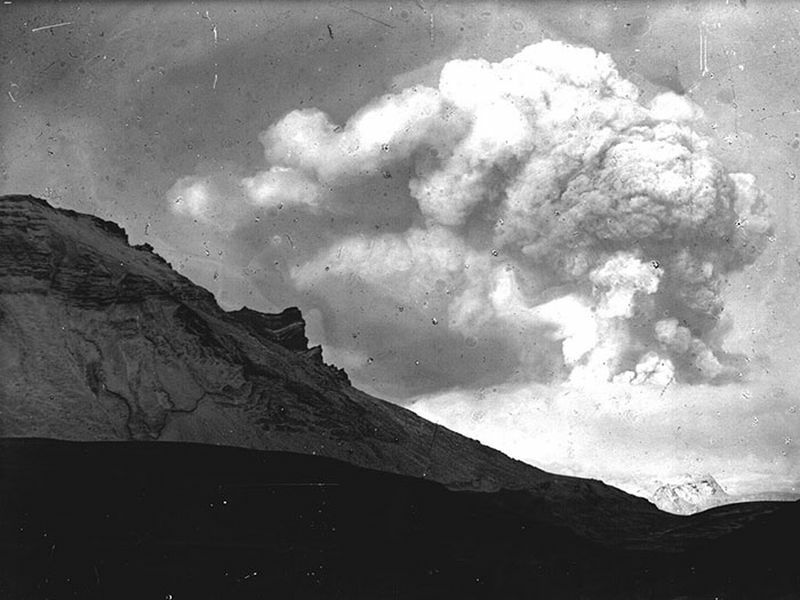 On 8th May 1860, the area around Katla once again trembled and rumbled with strong earthquakes and there was a small eruption which persisted for just under three weeks. The ejected material and the jökullhlaups which followed the eruption scarcely interfered with any settlements. 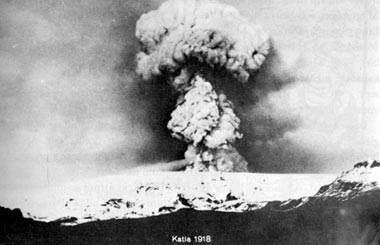 On 24th October 1918, the most recent confirmed eruption of Katla commenced, persisting for 24 days. This VEI4 or VEI5 eruption ejected around 0.7 km3 of volcanic material, which was widely distribution about the land. One of the largest jökulhlaups since the settlement of Iceland in around 871 CE occurred, horses and sheep were drowned and agricultural land around Álftaveri suffered great damage. As mentioned above, apart from possible small subglacial eruptions, Katla has not erupted for 99 years, which exceeds the previous 95 year maximum between eruptions. The earth scientists are closely monitoring Katla, as the signs indicate an eruption is very likely, and an emergency plan is in place. Mount Hekla is a comparatively young volcano mountain built from lava and tephra eruptions, situated at a rift junction where the South Iceland Seismic Zone and Eastern Volcanic Zone meet. In structure, it is something between a stratovolcano and a crater row which is very unusual. The Heklugjá fissure is 5.5 km long, and in major eruptions, this opens up along its full length. The top of the magma chamber is estimated to be 4 km beneath the surface. Erupted tephra contains a high volume of fluorine, a toxic mineral which is quite poisonous to animals. Before the settlement of Iceland, there were major eruptions around 7000 years ago (H5), 4000 years ago (H4) and 2900 years ago (H3). All produced large quantities of rhyolitic ash and tephra, in total covering 80% of Iceland. H3 was the largest eruption and is estimated to have pumped 7.3 km3 of volcanic material into the atmosphere. Temperatures were cooler throughout Northern Europe for several years afterwards, and tree ring datings reveal there was scarcely any tree growth for a decade. Hekla´s first eruption after the settlement of Iceland came in 1104. This VEI5 event ejected around 2.5 km3 of rhyodacitic tephra, which destroyed around 20 farms in Þjórsárdalur, a thriving and highly fertile valley 15 km away. One of these farms, Stöng at Árnessýsla, has been excavated and reconstructed. This surprisingly well-preserved and unique find offers a fascinating insight into 11th and early 12th century Icelandic and Nordic life. 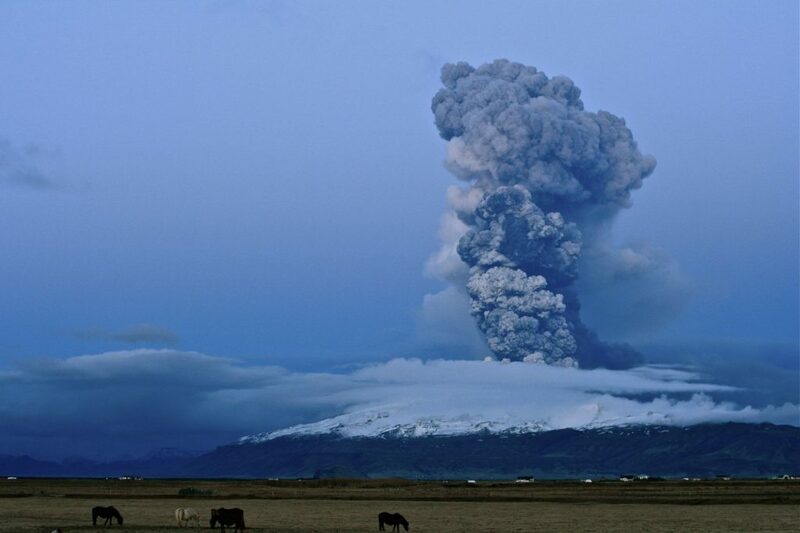 This eruption produced the 2nd largest ash cloud since Iceland was settled and caused Hekla to be feared throughout Europe. The volcanic debris was such that the Icelandic people called the winter of 1105 the sand fall-winter! There were smaller eruptions in 1158, 1206 and 1222 when, according to sources, the sun appeared to be an unusual red color because the fine ash was cast very high. It is said an eruption occurred in 1294 but no geological evidence can be found. Hekla´s VEI4 eruption in July 1300 expelled a destructive 30 km2 of tephra. The ash went north which was disastrous for farmers in Fljót and Skagafjörður. A severe famine followed and many people died. 0.5 km3 of volcanic material was produced compared to the 0.3 km3 produced in the 2010 Eyjafjalljökull eruption. In 1341, there was a smaller eruption which killed livestock and caused great damage to the rebuilt farms in Þjórsárdalur. 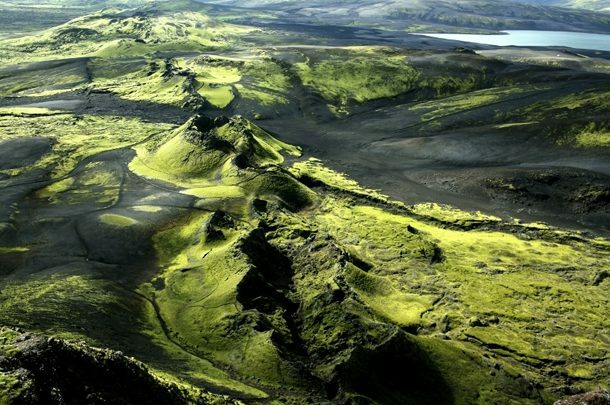 In the winter of 1389/1390, an eruption from Mount Hekla itself caused considerable damage to Skarð Farm. Sources conflict as to whether there was an eruption in 1440. Although there was an eruption nearby at Rauðöldur, this lava did not stem from Hekla. On 25th July 1510, a huge and very violent VEI4 eruption began. Exploding volcanic boulders were propelled 40 km west as far as Vörðufell. Rangárvellir, Holt and Landeyjar were covered in tephra and a man was killed in Landsveit. 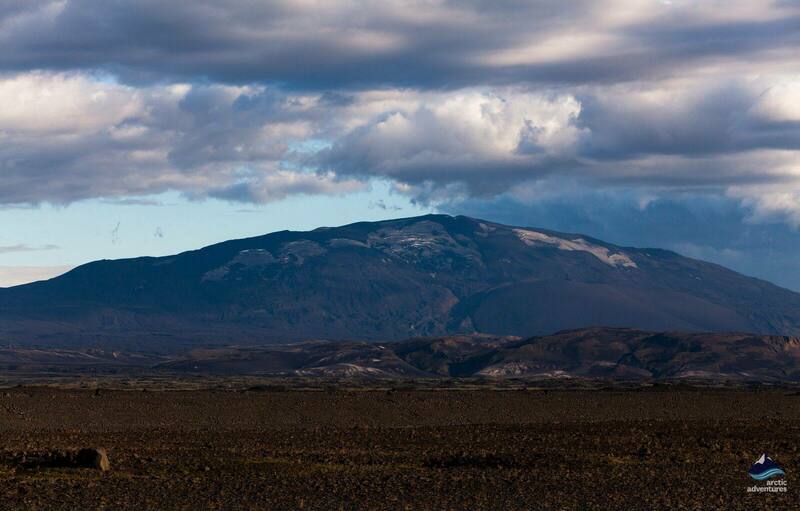 A 1554 eruption flowed south-west of Hekla creating the 10 km2 lava field called Pálssteinshraun. Another VEI4 eruption commenced on 3rd January 1597 which continued for a few months but caused little damage. Descriptions were dramatic. It was said that from some farms 18 fires could be seen, however, from Skálhalt it appeared that the mountain had become a giant single flame. In May 1636, a small eruption began which lasted more than a year, causing damage and killing livestock in the local area. 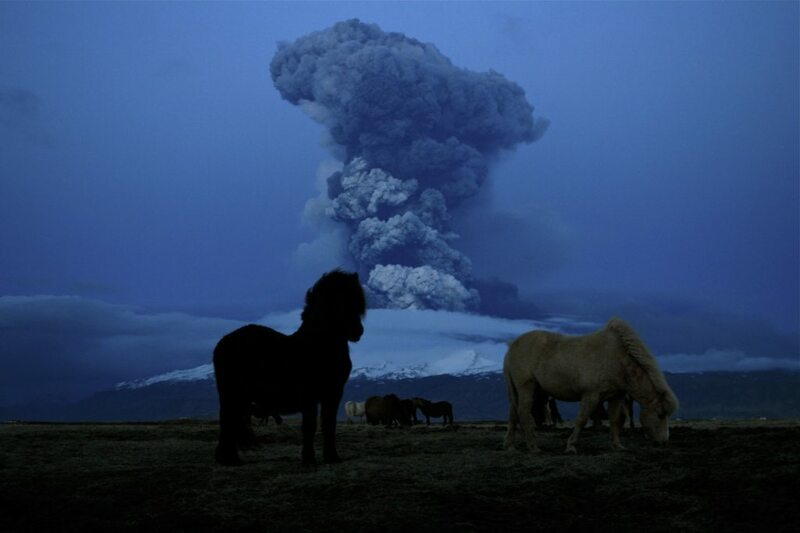 On 13th February 1693, one of Hekla´s most destructive VEI4 eruptions began, distributing tephra to the north-west, destroying farms and causing sheep to became ill over a wide area. Fish in rivers and lakes were killed and a large number of birds died. Damage was widespread over Landsveit, Hreppar and Tungum, ash was found in Norway and rained down on a ship in the Atlantic Ocean. Between 1766 to 1768 another VEI4 eruption flowed from Hekla, depositing tephra over Austur-Húnavatnssýsla, again killing livestock and fish. 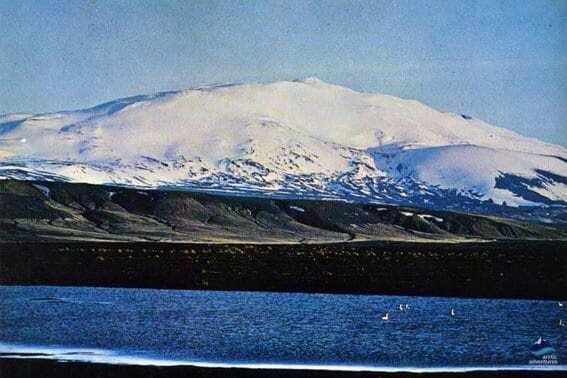 Hekla was calm for 60 years until another eruption began in 1845. The farm of Næfurholt had to be evacuated, while rivers in the area became hot killing the fish. The grass became toxic, making cattle sick and a great many died. Ash interfered with the routes of ships sailing between the Orkneys and Shetlands to the United Kingdom. In 1878 and 1913, there were small eruptions. On 2nd March 1947, a massive eruption began, heralded by strong earthquakes. Sounds from the eruption could be heard throughout Iceland as ash was hurled 30 km high. Huge volcanic boulders weighing half a ton could be found 4 or 5 km away, such was the explosive power of the eruption. This was the first time an erupting volcano was scientifically studied in Iceland, although unfortunately, one scientist met his death on the volcano. In 1970, 1980/81, 1991 and 2000 there were small eruptions. In 1970, 1980/81, 1991 and 2000 there were small eruptions.